Can we minimize fibro flares? If you have fibromyalgia, you likely know the triggers that precede a fibromyalgia flare. You try to avoid the triggers when possible and just get through them when you have to. However, it is never 100%. There can be variables internally and externally. The most important thing to remember is that it is never "all or nothing" when working through a fibro flare. Some flares will be a shorter duration, and some can last longer depending on the exposures and factors involved. I often say it is almost like being "poisoned" and working to bring the fibro body back to "homeostasis"
Remember that here we are talking about fibromyalgia flares specifically and not the entire multitude of fibromyalgia symptoms, which can be found and are described on the Fibromyalgia Symptoms page and the Extended Fibromyalgia Symptoms List page here on the site. Links to these also at bottom of article. Because fibromyalgia affects the ENTIRE body, so does a fibromyalgia flare as the adjacent graphic illustrates. And because everyone’s tolerance and condition is different, it can be hard to predict how long a flare will last in each individual fibro body. Flare symptoms might include increased pain levels, brain fog, pressure in the head, cold extremities, joint pain, swelling, malaise, swollen glands, increased fatigue and more. 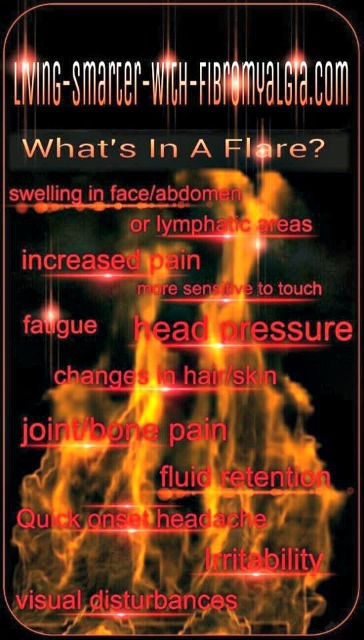 If you have fibromyalgia, you know that flares will likely be a part of your life. The idea is getting to know our triggers and the many variables that can precede or prolong a flare. This doesn't mean we can avoid them all together. It does mean that we may be able to lessen the severity and the time length of the flare by consistently being proactive. Working to eliminate toxins/chemicals in the home and anything used ON our bodies is the first step to reducing fibromyalgia flares. In doing this, we are strengthening our ‘core’ immune system by reducing the overall toxic load on our fibro bodies. I talk about this in the Environmental Illness article and throughout the website. My personal story with auto immune illness at a young age tells why I am so passionate about this. I simply do not use store bought body products and use only dye and scent free laundry soap and other natural agents such as vinegar, peroxide and baking soda. Also, without putting too many limits on our daily lives, we try to avoid outside environments that are toxic such as extended periods in shopping malls, clothing stores filled with formaldehyde, veterinary clinics, etc. Any place where a high level of chemicals are used and are off-gassing is generally not a safe place for a fibro body. Weather is impossible to control. All of us fibro bodies like to say that we are like "human barometers". We often react before and more intensely than other people. Joint pain, swelling, malaise, depression, etc. can all accompany weather changes. What about seasonal changes? I often talk about spring and fall bringing added challenges to the fibro body. You may feel extremely tired during the season changes and it is not uncommon to experience headaches and a tendency for extended flares. (For Spring allergies, I like to take quercetin, MSM and additional vitamin C.
Raw and local honey is also great for allergies. I've recently been talking about this on the FB page and how just a half teaspoon daily has been helpful for the intense pollen headaches I get every Spring. The best idea here is to plan ahead when possible, accommodate more self care time. I also find that movement like range of motion exercises are a great way to be proactive and ‘vent’ the fibro body during a weather related flare. Stress is a big offender and understandably so. The adrenal glands are already having to deal with an overload through compromised immune and endocrine systems. This is where meditation, gentle flowing movements, deep breathing and energy work come in. Adrenal Stress can really exacerbate symptoms in any chronic illness. If you have ever had a reiki session or attended a qi-gong class, you have likely experienced this healing and proactive energy. We can learn to do the same at home by simply taking the time to listen and work with our bodies. Distractions are good at times, but too many distractions on a daily basis will not allow us to see what is and what is not working. Stress from living with a chronic condition can lead to Adrenaline Dominance. Please refer to our books page, second book on list there. I do highly recommend reading this book. Sitting or stagnating through a flare is not only uncomfortable but will not lessen the time of the flare; moving the lymphatic fluid, oxygenating the body, and increasing blood flow (especially after a toxic exposure) is essential. Walking, swimming, using a rebounder (mini trampoline) or even sitting and gently bouncing on a large exercise ball is also a great non-invasive way to move the blood and lymphatic system and help to create a sense of well being. Get moving, get breathing, work to stay empowered even through a flare!! You might want to visit my facebook exercise page, Fibro Fit People1, for more help. Sleeping according to the body clock is one of the fundamentals in my protocol to control fibromyalgia flares. And, if you are on my facebook page, you'll see my cover graphic and the Fibro Bodies Clock; this signifies the importance of living and sleeping with our body clock. We also have many tips and suggestions throughout the website for lifestyle and natural Rxs to aid in regulating sleeping patterns. Not an easy task for the fibro body. All of my suggestions pertain to ‘natural’ sleep Rx’s, however because sleep is number one and if you are not getting it no matter what you do, talk with your doctor about a low dose sleep aid. The key is to only take the LOWEST EFFECTIVE DOSE and only while incorporating good sleep habits at the same time. For instance, if the doctor gives you 10 mg of a sleep medicine, do not assume that is right for your body. Use a pill cutter, and experiment with the lowest dose possible. Using too high dosage of any sleep medicine can have the opposite effect AND can become addictive. If other tools are being used consistently, the sleep aids should not be needed every night. And this will help us to better know which of the non invasive tools are actually working for us !! Please also refer to the menopause link in the following step where I detail the importance of progesterone and sleep. I personally have not needed a sleep aid since taking a slow dissolve troche of progesterone before bed. Men can also take progesterone for this purpose. Hormones …well, they are pretty much like the weather, although we have a bit more control, we cannot control phases of life, hormonal tides and fluctuations. We can however work to stay balanced through a "heal-thy" lifestyle. For women, if we are estrogen dominant for example, we can experiment with or talk with our doctor about natural Rx’s such as Shatavari , Vitex, Black Cohosh and/or natural progesterone creams or troches. 6) Can food lead to a flare? Last but not least, we need to be aware of all food allergens, additives and even mucous forming foods. Did you know that excess mucous in the body can contribute to pain? "Histamine Intolerance" can also pose an issue and contribute to symptoms. When we ingest foods to which we are allergic or simply have an intolerance, they can create excess mucous. This mucous is the body's way of protecting itself; however, just like with auto immune illness, it eventually works against us. The body is doing whatever it can to protect us. Yet this excess mucous can prevent nutrient absorption and create MANY unpleasant symptoms and increased pain. Become aware of food intolerances, keep a food journal and work to allow food to become your BEST medicine yet. Bottom line, if you have fibromyalgia, flares will happen. Let’s work to not let them get the very best of us …. Lisa. FG.